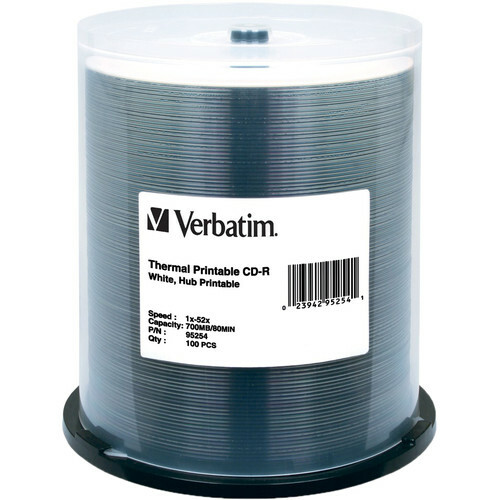 The Verbatim CD-R 700MB 52x White Thermal Printable, Hub Printable Disc (Spindle Pack of 100) is a write-once, recordable compact disc. The disc is made to provide sharp, clear graphics using color thermal printers. The 52x speed discs have a white, thermal, scratch-resistant surface. This surface optimizes thermal printing for superb high resolution reproduction of graphics text and logos. It is compatible with Rimage, Everest, or TEAC thermal printer technology. Box Dimensions (LxWxH) 6.2 x 5.45 x 5.45"
CD-R White Thermal/Hub Disc (100) is rated 4.7 out of 5 by 3. Rated 5 out of 5 by Purchaser Pat from Compact Disc Purchase This product is used almost every day. The white thermal ,hub prinable features are exactly what we need to use. The product is excetional and the service time for shipping was outstanding. Thanks and we will definitely be ordering this product from B & H in the future. Rated 4 out of 5 by Merlinator from Quality Priduct. Quality product and works great with Ramage Printers. Make sure you separate each disc from the other, they tend stick together. Rated 5 out of 5 by Krueger from Work Well, Cheap. Your basic printable CDs, they work, I've gone through over a thousand of them. I have no complaints.